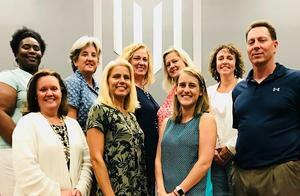 Seven Lexington Two career specialists, along with regional career specialist Lisa Call of Midlands Education & Business Alliance, spent the month of June "in school," completing requirements for the National Career Development Association’s new Certified School Career Development Advisor credential. The new credential is the first-ever K-12 specific certification offered to career specialists. Lexington Two was selected as one of only three pilot sites, making its participants the first in South Carolina -- and among the first in the nation -- to receive the new designation. Lexington Two’s participants were Lynn Bouknight, Pine Ridge Middle; Susie Day, Lexington Two job developer for high schools; LaVonya Deloach-Jenkins and Rebekah Shirey, Airport High; Kelly Strickland, Northside Middle; Allison Swygert, Fulmer Middle; and Gena Turner, New Bridge Academy. The new credential is similar to the GCDF, developed by the National Career Development Association, but adds two more units that focus specifically on best practices for serving students in K-12, as well as developing business/community/school relationships. The Profile of the South Carolina Graduate was developed as a framework to prepare SC students with the skills and knowledge they will need to be competitive in post-secondary training/education and in the workplace after graduation. Current labor market trends show a major skills gap issue -- the difference between what employers are looking for and the workers with those skills available for hire. School Career Development Advisors (SCDA) will now be better prepared to help close that skills gap by taking the lead on improving career readiness efforts in schools. Advisors will continue to provide students with career exploration opportunities such as interest/skills/values inventories, classroom career guidance lessons, career speakers, and college and industry field studies, and will better understand the needs of students, helping advisors to tailor opportunities to individual needs. They will develop relationships with businesses that will be looking to hire those students in the future. The SCDA will connect the education and business communities, and will seek out employment/intern/shadowing opportunities for students to connect them with employers for future opportunities. The class was facilitated by Mark Danaher, certified NCDA instructor.